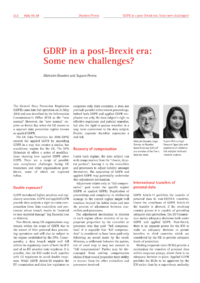 GDRP in a post-Brexit era: Some new challenges? The General Data Protection Regulation (GDPR) came into full operation on 25 May 2018 and was described by the Information Commissioners Office (ICO) as the new normal. However, the new normal expires on Brexit day when the UK moves to a separate data protection regime known as applied GDPR. The UK Data Protection Act 2018 (DPA) created the applied GDPR by amending GDPR in a way that creates a similar, but standalone, regime for the UK. The DPA (Schedule 6) offers a series of modifications showing how applied GDPR alters GDPR. There are a range of possible new compliance challenges facing UK businesses and other organisations post-Brexit, some of which are explored below.